To quote the doyen of Science Fiction, Robert Heinlein, «TANSTAAFL - There Ain't No Such Thing As A Free Lunch!». 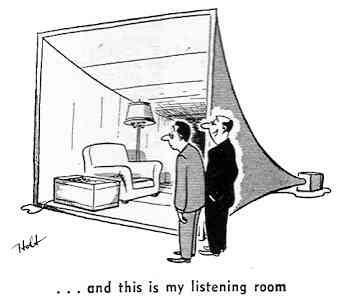 As with most things, size matters (not amplifier power!) 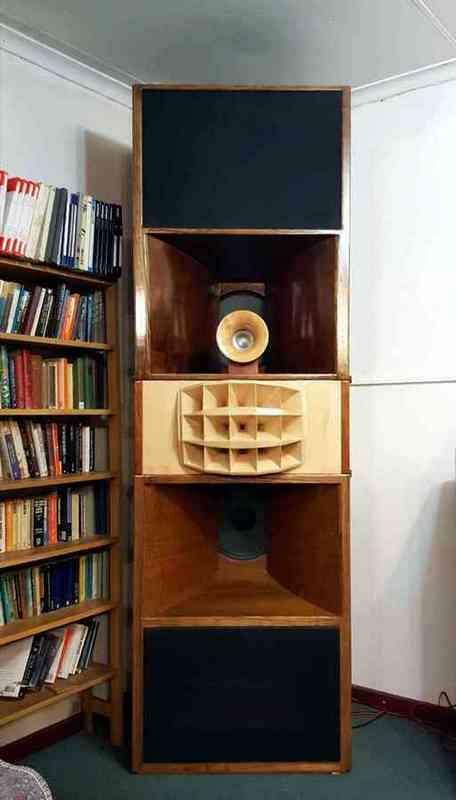 and my feeling is that a speaker needs to be as big as possible so that it can effortlessly reproduce music. There are always compromises that have to be made in hi-fi and nothing is perfect, but it behooves us to try and make any compromise as small as is possible in our own system. Speaker efficiency is one of those places where I refuse to compromise, and the speakers I build reflect that - usually to the detriment of any WAF! In Part 1 I laid out why I want efficiency and don't want to throw big power at a speaker and the additions made to the A7 clones as detailed below are an extension, maybe slightly mad, of my thinking. 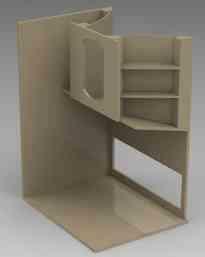 A slight recap of the cabinet design shown via a cutaway representation. 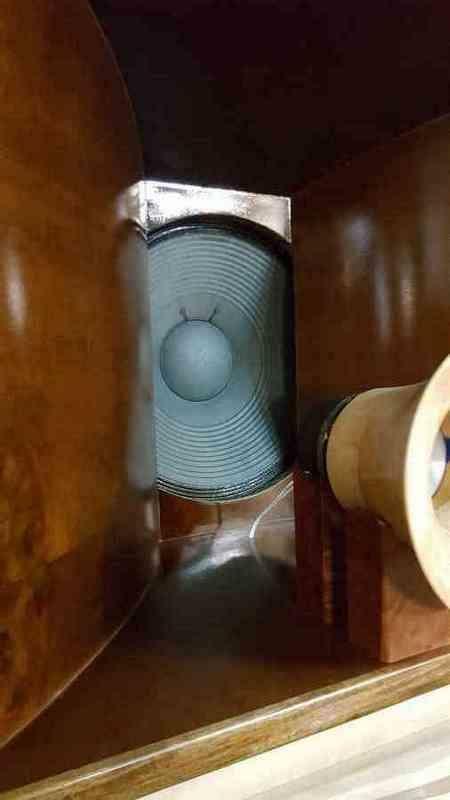 As can be seen, the hole in the speaker baffle somewhat masks the driver, this provides a degree of mass loading on the cone coupled with a short horn and the rather large port at the bottom gives an unparalleled degree of dynamic punch to the speaker system. Which is what Lansing needed for theater and cinema use and what makes for a startlingly good home system. One is good, rated by Altec for a room holding 800 people, two must be better so this is about my stacking two cabinets per side. This is not so as to give more volume, but to deliver sound with less strain, more dynamics and an extra 3 dB sensitivity. Many years ago, Jean Hiraga "tamed" an original pair of Altec Voice of the Theater speakers by extensively tweaking the crossovers. I started with a slightly different setup in that my originals were Fostex based and the crossovers were good, but the metal horns while fine from a distance were harsh close up and rang like a bell, if struck. They were also very powerful and, even with the gain control almost fully cut, still not very musical. The answer was to build up, from solid wood, multi cell horns which did away with the harshness. The picture below is of the original cabinets which were originally finished in industrial black rubberised paint and now are clad in wood to match the second pair made up from scratch. When these were sent in to be finished, it was found that they were 100 mm smaller front to back than the original Altec design. On listening to the two cabinets there is a slight difference in what passes for low bass (50 Hz), the Altec design going a bit lower. The final A7 Stack is on the right and despite the bookshelf next to the cabinets they cannot be called bookshelf speakers. They stand 2.55 meters high by 800 wide and are pushed back into the room corners. Separation between the cabinets is cone center to cone center, just over 7 meters and are "aimed" at the listening position. The lower cabinets are fitted with Goodmans Audiom 81 15" drivers, rated at 20 Watts; the upper have Fostex L475 16" drivers, rated at 150 Watts, and both have a Fs of 25 Hz. The Fostex is rated at 100 dB (8 Ω) sensitivity and I can't find a sensitivity for the Goodmans (16 Ω). Both are run via the Fostex crossover in parallel, and if they differ in sensitivity I can't hear it. The HF is via a Fostex D252 driver into the wooden multi cells also via the Fostex crossover. The JBL 075 tweeter has been mounted in a small Tractrix horn and is fed direct via a small cap, as I don't like the sound when the crossover is used. In the near future a ribbon super tweeter is to be added. Frequencies below, where the main cabinet don't have much output, are reinforced via my subwoofer, the cutoff point and gain can be set to suit. 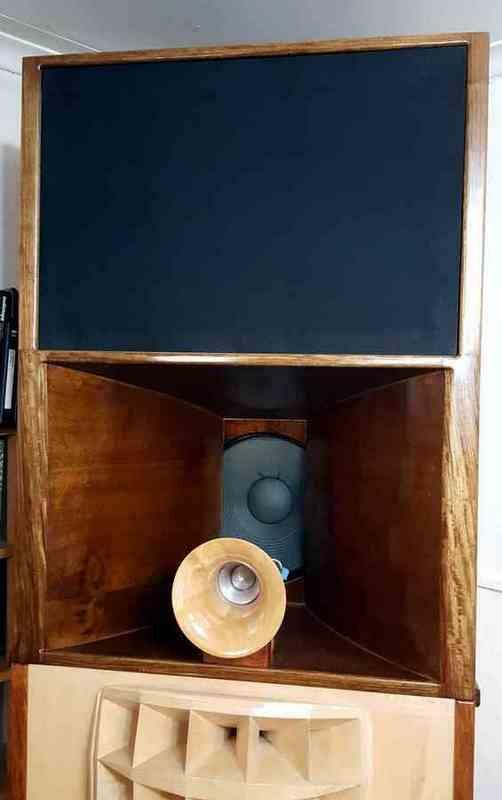 The purpose of this build was to get a speaker that would reproduce music as close to what one would hear at a concert and it is now very close or as close as it's possible to get at home via a hi-fi. One very important part of music is the dynamic content and with the A7 clone stack this has been realised and listening to any music from solo flute to heavy bass drum is faithfully reproduced and I emphasize, as close to real as I have heard from a hi-fi. Where they stand out in comparison to the normal type of speaker is that the whole range is tonally correct as far as I can hear. In part, this is due to some "blending" between the two different bass drivers and the way the multi cells have tamed the D252 HF driver. There is no real sweet spot, other than in the high treble in the main due to the multi cells almost spreading the sound around - in fact it is possible to hold an LP cover between either speaker and ones head without noticeably changing the sound. The usual caveats about recordings apply but with any reasonably good one the speakers disappear (it helps to close your eyes as ignoring the things visually is a bit difficult!) and all that's left is this wonderful sound field with instruments sounding in different places. As it should be. Another place where the speakers excel is creating the illusion of the recorded venue. Some of the 1960's Bernstein recordings feature the New York Subway and cars in the street and it sounds and feels like they are just outside. The Dorian recording done in the Meyerson Symphony Center with Guillou on the organ there are different settings used on the acoustic sails for the Jongen and then the Saint Saens and this is very plainly audible. Another recording that replicates the space and grandeur of a big organ is St John the Divine/Murray; a sample on Youtube. The power required to make music on these speakers does not have to be much. Even though I generally use a TacT/Lyngdorf amplifier, a Leak Stereo 20 with 8 undistorted Watts does not have to be driven hard to play at deafening levels. I estimate the sensitivity is very close to 105 dB/W, but with a frontage of just over two square meters I am at a loss as to where to put the measurement mike. As an effort at making a really top class speaker system this has, I think, worked. It can play with the delicacy of an electrostat, the definition of good ribbons and the brashness of a full brass band, all without any signs of strain or compression. The original design of the A7 cabinet is very good and using a non Altec driver seems not to matter. Both the Fostex and Goodmans work well as separates and combine into something better. Neither show any cone movement even when faced with really big bangs and crashes; the Liefs Saga Symphony, for example, and rock music is tame compared to that. Organ and orchestra is also played back with aplomb and, in the case of either the Wanamaker or Atlantic City Convention Hall, organs not only is the scale reproduced but the venue too. I can do no better than to repeat the following from Peter Walker the founder of Quad: «I am still in favor of documentary type reproduction - an orchestra plays on a stage or in some auditorium and we try to get a real, believable picture of it. This is becoming out of date, of course. It's now thought that a completely new type of sound should be produced. I can't argue against this. I can't say there's anything wrong with this. Perhaps if Bach were around now he'd do the same thing, hit you on the head and do all sorts of things to produce an effect. But my own personal preference, my own goal, is to create a true sound picture of some acoustic event which is taking place somewhere else. The argument against that is that it had to be produced in a concert hall at one time, because there was no other means. But why should one stick to the concert hall? I stick to that, but that's just personal prejudice». The Bold is mine and this pretty much sums up what I have set out to obtain - and it's very, very close. 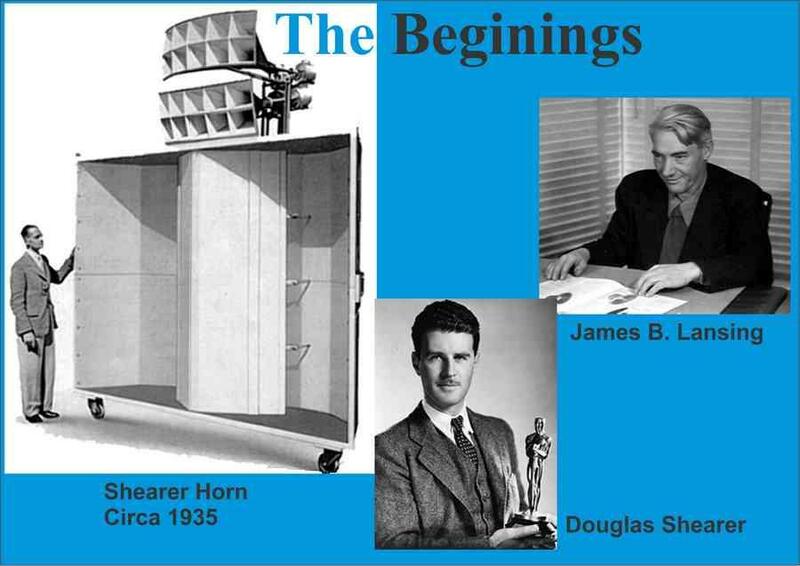 An interesting link of the first horns used for cinema from 1936 is Shearer Horns. Other links (for interest only): www.avforums.co.za (bottom of the page) and Bop Studios Story (the man that wrote this commented that this system is as good and the sub probably better than the main studio at BOP; he was one of the recording engineers there in it's heyday). This speaker system can easily damage your hearing as it can sustain very high volume levels.